François Roche is the principal of New-Territories (R&Sie(n) / [eIf/bʌt/c]). He is based in Bangkok for [eIf/bʌt/c], in Paris for R&Sie(n) and in NY with his studio of research at Graduate School of Architecture, Plannin and Preservation (GSAPP), Columbia University. Through these different structures, his architectural works and protocols seek to articulate the real and/or fictional, the geographic situations and narrative structures that can transform them. 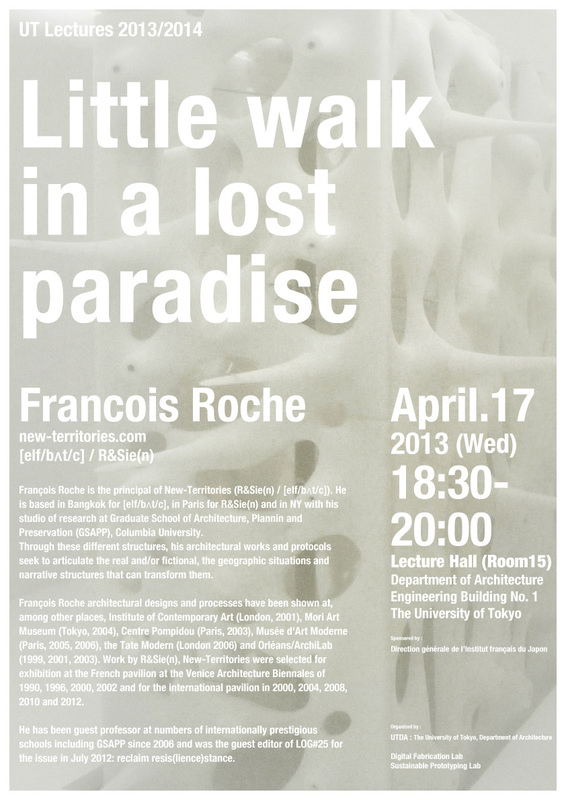 François Roche architectural designs and processes have been shown at, among other places, Institute of Contemporary Art (London, 2001), Mori Art Museum (Tokyo, 2004), Centre Pompidou (Paris, 2003), Musée d’Art Moderne (Paris, 2005, 2006), the Tate Modern (London 2006) and Orléans/ArchiLab (1999, 2001, 2003). Work by R&Sie(n), New-Territories were selected for exhibition at the French pavilion at the Venice Architecture Biennales of 1990, 1996, 2000, 2002 and for the international pavilion in 2000, 2004, 2008, 2010 and 2012. He has been guest professor at numbers of internationally prestigious schools including GSAPP since 2006 and was the guest editor of LOG#25 for the issue in July 2012: reclaim resi(lience)stance.